A Knox County student is among a team of six students from the Kentucky School for the Deaf (KSD) that competed in the 2019 Deaf Culinary Bowl in Las Vegas the weekend of March 9. Aeiral Collins, a Knox County senior, attends the Kentucky School for the Deaf. Together with her peers the KSD team, who call themselves “The Def Chefs” took third place at the national event. With that in mind, the chefs got to work. They created a menu that began with Marryin’ Sam’s Atlantic Salmon (served on a bed of wilted spinach, maple bacon dressing and cheese fan), followed by Rock ‘n Roll Pork Roulade (pork tenderloin stuffed with spinach, sun-dried tomatoes and chimichurri sauce) served with Double or Nothing Chimichurri glazed Vegetables (roasted asparagus, carrots, zucchini and squash) and finished off with Dragon’s Delight (deconstructed s’mores with marshmallow fluff, chocolate panna cotta and crumbled graham crackers). Six students from the Kentucky School for the Deaf (KSD) placed third in the 2019 Deaf Culinary Bowl in Las Vegas. The Def Chefs, as they call themselves, consist of seniors Sarah Joiner and Aeiral Collins, juniors Layne Adkins, Plah Meh and Benny Shirley, and sophomore Mi’Keyla Crumble. Seven schools from around the country competed at the event. 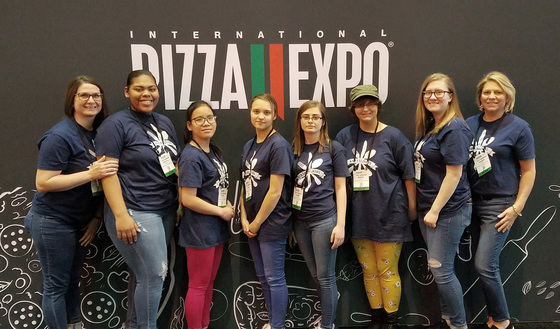 While on the trip, KSD’s students attended the International Pizza Expo, which also was being held in Las Vegas.